On January 23rd, Telenor announced a complete revamp of its famous data packages called Data Suboo. The new monthly packs range from 700MB to 15.5GB which should fit every customer need and budget. 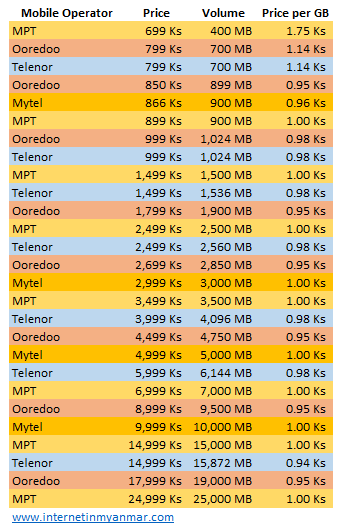 Price-wise, the Norwegian mobile operator tries to keep it below 1000 Ks per GB. As we will see later in this article, the mobile operators are all tightly aligned on the same price bracket due to regulation. What is roll-over? Mobile data packs all come with an expiry date. This means that if you do not consume your data volume within the validity period, it is gone. With roll-over, you can get the unused data back if you purchase a new pack. Roll-over can become very handy if you are not a heavy Internet user. 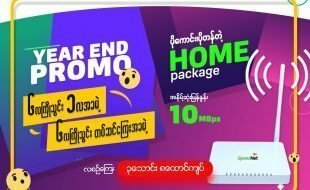 MPT, Mytel, and Ooredoo offer this feature already but the roll-over is only possible within 7 days after the expiration of the pack. With these new Data Suboo packs, Telenor offers unlimited roll-over which is definitely a big plus! Telenor launched a while ago a service called Data Suboo Share. This service allows every Suboo user to transfer data balance with friends and family. 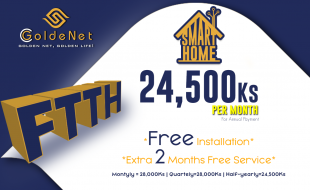 The service used to be charged 50Ks per transaction and is now free of charge with the new data packages. Myanflix is a video on demand service that offers a vast catalog of Myanmar movies and shows. By subscribing to Data Suboo, customers now get free access to the complete Myanflix library for 30 days. Overall, nothing incredible with this new range of data packs but a small range of features that could be useful for some customers. If we look at the price comparison table, we can see that the difference between the mobile operators is smaller than ever. As price is no more a key differentiator, mobile operators need to be creative and find new features to differentiate themselves from the competition. As we can see, there is a certain price status quo and this could appear like bad news for the end customer but it is not. Because mobile operators have no choice than to find other means to steal subscribers from the competition. 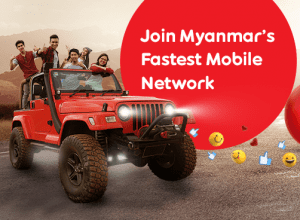 Like being the fastest mobile data network in Myanmar. Or providing exclusive content to their subscribers. 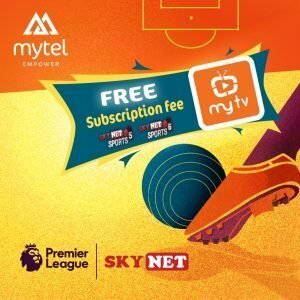 On this matter, Mytel shot a strike by offering its subscribers free access to the English Premier League. 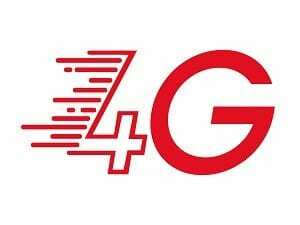 Mytel leverage on an exclusive partnership with paid TV provider Skynet to broadcast Sports 5 and Sports 6 on its mobile data network. As for Ooredoo, it preserves its long term partnership with iflix and offers 6 months of free subscription to any new subscriber. The red guys also announced this week a new partnership with the OTT platform Viu. Viu is a Hong Kong-based streaming service which offers Asian dramas, variety programs, anime, and entertainment news with Myanmar subtitles. Ooredoo gives away premium access to Viu for all its subscribers as long as they connect to the streaming service via Ooredoo mobile data. The trick? You still to pay for the data usage of course.